Can you believe 2016 is over? or better yet, are you glad it's over? As you get older, the years go by faster and faster, and this one was a blur. It was also a challenging year logistically as all the companies dumped their products at once and that was after I had vowed to myself not to spend a fortune buying the latest and greatest just for the sake of a few extra page views. Ice cream hunting is fun, but spending an extra 40% to review it first has lost a bit lot of luster for me... look, I'm sidetracking already, let's get to the countdown! 10 Talenti Peanut Butter Pretzel Gelato. With seven new flavors for 2016 (one of them exclusive to Publix), Talenti manages to grab two spots in the top ten for a third year in a row. 9 DQ Royal Rocky Road Brownie Blizzard. It doesn't surprise me that the core line up made it into the top ten, but I don't see this being a thing long term. 8 Talenti Key Lime Pie gelato. Here is Talenti's second entry in the top ten but yet again they are denied a spot in the top five. They played it fairly safe this year so this isn't totally surprising. 7 Haagen-Dazs Brownies a la Mode ice cream. Two other of the destination series actually came in at 11 and 12 but it's brownies that cracks the top ten. 6 Haagen-Dazs White Russian ice cream out of Canada (thanks to Jeff for this review). So far the only other "special edition" to be announced is Peppermint Bark which we've had in the states for years now. 5 Ben & Jerry's Pecan Sticky Bun. It's a little surprising that a walmart exclusive made it in to the top five. It's a fine flavor that hopefully you got to find during it's limited run. 4 Haagen-Dazs Sweet Cream Coffee Caramel - this is kind of surprising because I wasn't even going to try this one. I'm glad I did because it was both tasty and attention grabbing. 2 Ben & Jerry's Cake My Day ice cream by our very busy friend Nick. Not sure how many reviews will get from him in 2017 but only time will tell. The funny thing here is that neither one of us clicked with this flavor. Ben & Jerry's returns to the number one spot! 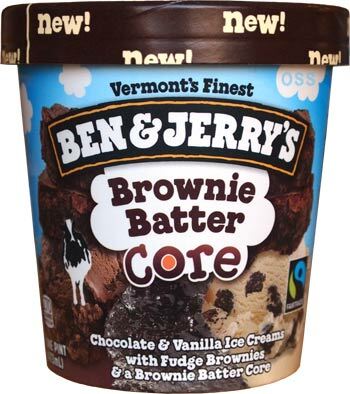 Ben & Jerry's Brownie Batter Core ice cream was the most read review on the site by about a 20% margin. It's kind of funny that brownies made it in to three of our top ten spots. That's it, what do you think of this year's roundup? Who would you have added or who do you wish wasn't on the list. Also, what trends are you hoping for in 2017? We should only be a few weeks away from the first new flavors. Let me know your thoughts in the comments and have yourself a good new year's eve! What was the worst ice cream of the year? (though I thought there was more on that list). I'm thinking Breyer's ultra-boring take on ice cream cake ice cream was probably the most upsetting disappointment. I'm glad Talenti's Peanut Butter Pretzel made it. I just had it last night and love the flavor and huge chunks of peanut butter in it. So fresh and tasty! I thought the coconut caramel flavor was the best of the core line. And I liked the sesame seed brittle best in the destination series. Please review the new Baskin Robbins molten lava cakes this year. I want to know if they are good. I hear the ones at Arby's are great. My favorite is the Ben & Jerry's Confetti Cake ice cream! Unlike most people I can't stand raspberry in ice cream with the exception of Black Raspberry flavors & thus didn't care for Cake My Day. I'm hoping a Wal-Mart that I shop at more frequently will finally get it in stock. correct, you don't understand how the list is compiled. sorry, but it was just to tempting to respond like that. this isn't my personal top ten, this is the top ten 2016 reviews ranked by number of pageviews. I do this list at the end of every year. it lets everyone know what everyone else is curious about.